Finally, an author I can make an actual comment on! I met Lewis Shiner, briefly, in Boston in 1989. He was at NoreastCon, which was WorldCon that year, and so were my husband and I. In fact, I met him at the same time I met Connie Willis, and while I doubt that either of them remembers one fangirl among hundreds, it was a big deal for me. I just remember how real it felt to me, at that time. This was the ’80s, and the ’60s were well on their way to becoming the mythic land of our youth. “Glimpses,” for me, is a kind of electric koolaid acid test mixed with the sweet, honest sentiment of “Field of Dreams.” Maybe we really could have made a difference. Maybe we really could have built a better world. Instead, many of us turned into Republicans and Shiner’s writing hints presciently of that loss. “Deserted Cities of the Heart” brought Mayan culture to my attention. And skateboarding. Yes, in the same book. “SLAM” was the strangest, most utterly cool thing I’d ever read at that point in my life, and I absolutely loved it. Shiner kinda drifted out of sight on the SF after a while, but thanks to our friend Wiki, I see that he moved into writing more mainstream-type novels and also into providing his work online. His “Fiction Liberation Front” http://www.lewisshiner.com/liberation/index.htm offers almost all his work, in PDF and HTML format. Shiner really deserves more recognition than he gets. His “Hunter Thompson goes on a road trip with Carlos Castenada set to an awesome ’60s soundtrack” manner is mind-strippingly original. He also lets you remember skateboarding when skatepunks were cool rather than threatening. Go forth and read some Lewis Shiner. I bet you’ll enjoy it! Here’s an embarrassing start for me on the science fiction Author August challenge: Today’s author is Vernor Vinge and I’ve never read anything by him. I’ve looked at several of his books, but nothing ever really called out to me. So somebody needs to make me a recommendation. What Vernor Vinge book do I need to read? I’ll say this about him: He was once married to Joan D. Vinge, who wrote one of my all-time favorite science fiction novels, “The Snow Queen.” I first read that book years ago, back when I was a member of the SF/F Book Club and got it in one of those cheap hardcover editions, and fell in love. For some reason, the character who resonated with me deeper than any other was Herne, the Starbuck, a furious crippled man who’d had everything and lost it. But all the rest is fabulous as well, from the star-crossed main characters to the mysterious mask maker to the Snow Queen herself. As much as the people, the world and the greater universe is also wonderfully drawn and become almost characters on their own. So thanks, Vernor Vinge, for once upon a time having an awesome wife. First of all, if you don’t know who Jim Butcher is and you haven’t read any of his previous Harry Dresden novels, this is NOT the place to start. Got that? 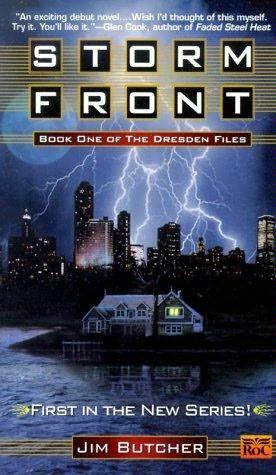 Start with “Storm Front,” the first of now-13 amazingly entertaining books about the adventures of Harry Dresden, Wizard for Hire. That’s not to say that you have to read all the books, although once you’ve read one I defy you to stop. They’re like the best, most addictive potato chips ever. Compulsively readable. Butcher builds a strong cast of primary and supporting characters slowly through all 13 books, until it seems as if the stories are as much about Michael and Molly, Susan and the vampires, Thomas and the other vampires, Harry’s fairy godmother, Butters and Maggie and Mort and Kincaid and Ivy and Ebenezer and… the list goes on… as about Harry. And of course, they’re all about Chicago cop Karrin Murphy and Bob the Skull. Not to mention Mister the cat and Mouse the temple dog. I’m reading back over that paragraph and thinking, sheesh, this sounds like just about the most twee thing since the invention of twee. But it isn’t. The cover copy on “Ghost Story” suggests crossing Buffy the Vampire Slayer with Phillip Marlowe, and that’s not far from accurate. Harry’s a wizard. The supernatural obviously plays a huge part in his world. But you’ll find no Disney fairies or True Blood vampire hunks here. Dresden’s supernatural is vast, tricksy, and might just as well rip you to shreds as talk to you. Dresden himself, the character, pulls all these books out of the slop-bucket of quasi-fantasy crap that’s been sloshed on the SF/F reading world in recent years. Dresden is a loner, a smartass, witty and funny and capable of enormous destruction. He’s kind, will do anything for his friends and often for complete strangers, and he makes mistakes. Oh, boy, does he makes mistakes. And his mistakes have consequences. Which brings me to “Ghost Story,” the 13th Harry Dresden novel, in which entire coops full of plot chickens come home to roost in Harry’s world. How he deals with the repercussions of past successes, past mistakes, and past failures is a large part of the driving force of the novel. Oh, there’s a standard plot, and it’s a terrific Dresden adventure on its own. But “Ghost Story” is more about reflection. It’s about the time which comes to most everybody, when you stop slogging and pushing and fighting to go forward and suddenly are forced to look back at what you’ve left in your wake. Intentional and unintentional. Harry Dresden books don’t make me cry. This one did. So… don’t start out with “Ghost Story.” But if you’ve got time to spare and you’ve been looking for a series that will entertain, enlighten, amuse and sometimes cause you to chew your fingernails, pick up a copy of “Storm Front” and start reading. And when you get done with “Ghost Story,” drop me a line. We can hold cyber-hands and get ready to move on. 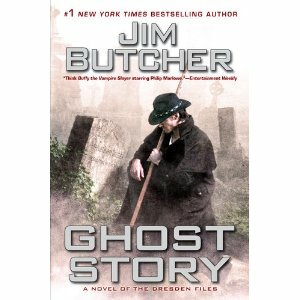 So Jim Butcher “Dresden Files” series, many many thumbs up. Jim Butcher otherwise, you’re on your own.